Dmitry Medvedev is making steps toward civil society: the presidential human rights council will be allowed to issue its own expert opinion in such high-profile litigation proceedings as the Khodorkovsky or Magnitsky cases. President Dmitry Medvedev has proposed that the Council on Promotion of the Development of Civil Society Institutions under the president of the Russian Federation prepare an expert legal opinion on high-profile cases, namely the Khodorkovsky and Magnitsky cases. Vedomosti was informed about this by several participants in the council’s meeting, which was held on Tuesday in Yekaterinburg, where the president was present at the unveiling of a monument to Boris Yeltsin. 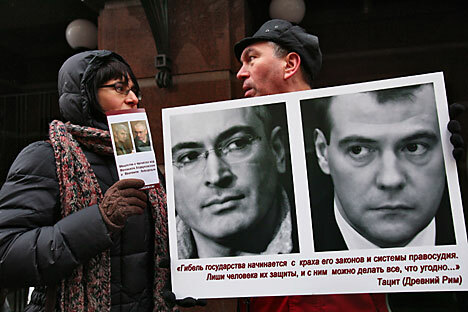 The Khodorkovsky case was discussed by the chairman of the Council on Foreign and Defense Policy, Sergey Karaganov, and a leader of the Expert Council of the Club of Regional Journalism, Irina Yasina, said Kirill Kabanov, chairman of the National Anticorruption Committee. Meanwhile, Medvedev was the one to bring up the Magnitsky case. Council members had expected that the late attorney for the Hermitage Foundation be mentioned by the new Council chairman, Mikhail Fedotov, in his report. But that did not happen. If there are questions, then the council could create a group and conduct an independent legal investigation, said the president. An assessment of some of the higher-profile cases can be made by a legal group operating as part of the council and its experts, said the head of Transparency International, Elena Panfilova, who added that the examination should take into account a wide range of public opinion. In fact, such work is already being conducted. For example, the council is working on the Magnitsky case; the only thing left to do is include several conclusions in the document, she says. According to Kabanov, council members will get the opportunity to request additional documents related to the cases which they will now begin to examine. He suggested that the results may not correspond to the official point of view or a court’s decision. “In any case, we will report to the president,” said Kabanov. Medvedev’s trip to Davos pushed him to have a careful approach to the high-profile cases, says a source close to the presidential administration. That is where he was most often asked these types of questions. Khodorkovsky’s attorney, Vadim Klyuvgant, recalled that the first to suggest making court rulings a subject for professional discussion was Justice Minister Aleksandr Konovalov. “The precedent could be life changing; it all depends on how independent and professional the examination is,” said Klyuvgant. During the same council meeting, the president announced that he had decided to expand the powers and the composition of the advisory body on civil society issues. No fundamentally new privileges have been given, says one of the council members; the main goal of reorganization boils down to increasing the number of the president’s people within the advisory body. When the human rights system was not as relevant, people were invited onto the council by its former chairwoman, Ella Pamfilova. Now the situation has changed, so analyses of high-profile cases will be conducted under close supervision, concluded Vedomosti’s source. Yesterday, the president introduced seven more people on the council – its members learned about this in Yekaterinburg. The newly appointed deputy chairman became Sergey Vorobyev, co-chairman of the non-profit organization Club 2015 and head of a headhunting agency which is involved in shaping the presidential service. The council will be allowed to do more than before, but the Kremlin’s opinion will also be considered to a greater extent, confirmed a Kremlin official. In view of his very active public life during the pre-election year of 2011, Medvedev promised to meet with civil society representatives three times a year, instead of once, as it was done before.